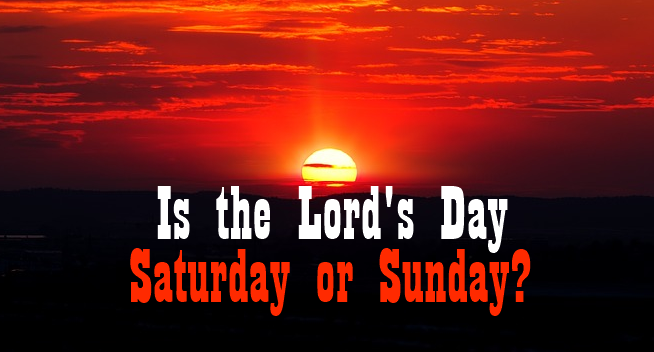 There is a lot of misconceptions out there about which day is the Lord's day. I would like you to know that the Lord created and owns all seven days, but there is one day in particular that He called it His day. Now, in order for us to know which day the Lord set aside and called His day, we have to go into the Bible. So Let's begin. Mar 2:28 "Therefore the Son of man is Lord also of the Sabbath." Matthew 12:8 says "For the Son of man is Lord even of the sabbath day." Luke 19:10 says "For the Son of man is come to seek and to save that which was lost." Matthew 1:21 Says "And she shall bring forth a son, and thou shalt call his name Jesus: for he shall save his people from their sins. So, we can see already from the above passages of scriptures that the Son of man is Lord of the Sabbath day and the Son of Man Is Jesus. But let us continue to establish this some more from the word of God. The book of (Exo 20:10) says"But the seventh day is the sabbath of the LORD thy God: in it, thou shalt not do any work, thou, nor thy son, nor thy daughter, thy manservant, nor thy maidservant, nor thy cattle, nor thy stranger that is within thy gates"
Exo 20:11 "For in six days the LORD made heaven and earth, the sea, and all that in them is, and rested the seventh day: wherefore the LORD blessed the sabbath day, and hallowed it. " Luk 6:5 "And he said unto them, That the Son of man is Lord also of the Sabbath." From the scriptures given upon, we can clearly see that the Saturday, which is the Sabbath is the Lord's day and not Sunday as some have falsely claimed. We hope this has answered your question and God bless.